1) It helps you to get more opportunities in your career as you can be easily spotted by potential employers or sponsors. 2) It helps you to tell your story the way you want it to be told. 3) Online presence is the best way to promote a business and its services. A domain name is an identification string that defines an organization or other entity on the internet. In other words, it is a URL that identifies your site and makes it able to be found on the world wide web. It is the place or tool where your website is stored and maintained. It allows you to use the domain-based email address like address@domainname.tld which makes the email address look professional and trustworthy. It allows you to protect your website if it handles sensitive information like credit cards or other account information. It provides privacy, critical security and data integrity for both your websites and your users' personal information. Domain name is the first step towards the online presence. Its function on the internet is similar to a physical address in the physical world. Before you can use it, the domain name needs to be registered. 1) Sign into your Namecheap account (The Sign In option is available in the top hat of the page). If you do not have an account with us, feel free to sign up here. Once you have the domain name registered, you may need a page or series of related pages that would represent you or your company and show up when you enter the domain name in the browser. The most relevant example would be this article, which is a page on the Namecheap website. There are lots of different ways to get a website online. Some of them require technical expertise and experience in things like HTML, CSS, and other coding languages. But there are ways to build a website without any of those skills – the easiest to use is a website builder. We currently offer several website builders at our Apps Marketplace. You can find more information about our Apps Marketplace in this section. Using these services, you do not have to be a developer or designer to make a great site. They allow you not only to create a great website, but also to give the power to maintain it as often as you like. Website builders are suitable for anyone with a basic understanding of technology – if you can post photos or videos to Facebook, then you meet the requirements. Once purchased, your apps will be available in the Subscriptions area here. Our hosting service will suit needs of both beginners and advanced users. A hosting account apportions space on a server and includes a set amount of data transfer traffic from your computer to the host's server so you can upload entire pages, images, multimedia files, or change existing pages. If you're a beginner, without coding knowledge, you can start with our Website Builder plugin. It provides visual design options and comes with short, built-in interactive video tutorials to guide you through the process. You can check the full list of its features in this article. In case you are an advanced user, hosting allows building your own website using different coding languages or special site-building software, that requires to be installed on the server, upload created pages with sophisticated functionality and modify your site in almost limitless ways. In case you wish to get another hosting plan, feel free to review our hosting packages at this page. Once a hosting plan is purchased and activated, our system will email Your Hosting Welcome Guide with all login details to your contact email address. You may find its example in the following article. More details on steps to take after receiving a Welcome Guide can be checked in this section. The main difference between both services is in the functionality they provide. Website builders at our Apps Marketplace is mainly used to create simple landing or informational pages while hosting service allows creating fully functional complex websites. So considering the differences, you may use a website builder service to quickly create a landing or "under construction" page for your website while building a more complicated site in a hosting environment. Also, you can have multiple websites created in one hosting account, which means that our web-hosting solution will be the best option to manage them all. Your email address is a valuable tool to market your website. An address like address@domainname.com tells people you have an online domain (domainname.com) where they can find out more about you. It makes you stand out, providing you with a kind of power, expert status thing. So you may consider getting a benefit from one of the email services we offer. If your domain is using our Basic/Backup/Premium nameservers, you may take advantage of our free Email Forwarding service. With Email Forwarding, users can send emails to address@domainname.com, and the emails get forwarded to any email address of your choice where you can check and read them. This is a great choice if you are not going to send emails to other people using the domain-based email address. You can find more detailed information on this service and how to set it up here. 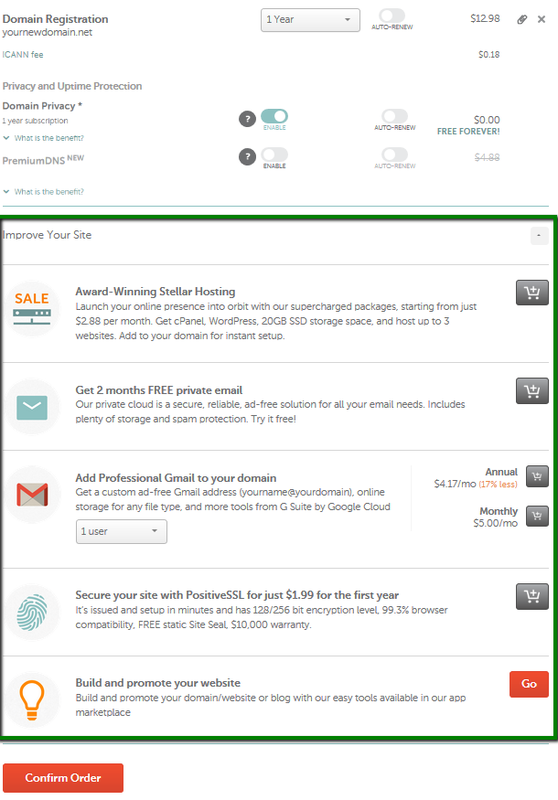 With a new domain registration, you may also grab our PositiveSSL at an exclusive promotional price for the first year. PositiveSSL is one of the most popular and inexpensive certificates in the industry. Typically, SSL is used to secure credit card transactions, data transfer and logins, and now becomes the norm when securing browsing of social media sites. Moreover, it may positively influence your website ranking as Google increases it for websites that use the https protocol. You can find more details about using this security feature here. In case you already have hosting/website building services purchased elsewhere and they provided you with nameservers to use for connecting the domain name and your website, you may consider specifying custom nameservers right during the checkout to save your time later. If you are registering the domain name on behalf of someone else or want to use the contact details that differ from the ones in your account, you may need to check the domain contact details. You may also consider checking our Knowledgebase to get more detailed information and tips on domain management, hosting account management, email services and SSL certificates installation. NOTE 1: There is no need to provide any identifying documents to purchase our services, with the exception of OV and EV SSL certificates. Still, it is highly recommended to use real and accurate contact details in order to comply with ICANN's requirements for domain registration as well as for Domain Validation SSL certificates. That is it! Welcome to the online world!